I’ve been wanting to feature the Tensorate novellas by JY Yang, The Black Tides of Heaven and The Red Thread of Fortune on my blog ever since their release. These books are stunning from cover to cover, whether it’s their exquisite cover art to the rich world that lies within. Today, I’m sharing with you a brief review of the two novella, as well as some graphic fanart you can use as phone wallpapers. I am a huge fan of the Tor.com novella imprint, and the Tensorate novellas exemplifies all the reasons why. These books are vividly imagined and champion voices long ignored by SFF. These twin novellas fittingly follow a pair of twins, Akeha and Mokoya, spanning the first few decades of their lives. They are significantly different in tone, tied together by this vastly imaginative world and the strength of the sibling’s bond. Akeha’s book is an introspective saga about family, destiny, and choice. Mokoya’s novella explore her emotions and its manifestation over few short but action-packed days. The Tensorate series unfold in a world that is at once reminiscent of East Asia, yet filled with wonders such as the Slack elemental manipulation and advanced biotechnology. At every turn, there are delightful surprises within the layers of world building, from raptors to visually impressive feats of slackcraft. While the novellas are short, an immense amount of detail is packed within these pages, allowing the readers to fully appreciate the various factions with the Protectorate and the brewing tension between them. I love the exploration of gender within these novellas, facilitated by a world where gender is not assigned at birth – but rather chosen by each person (and what a world that would be!). Upon this decision, the person can choose whether they want to take gender confirmation drugs. The novella’s examination of Akeha and Mokoya’s individual choices was especially well-executed. At the moment, there are two more planned novella set in this world, with The Descent of Monsters set to release on July 31! I’m still secretly holding out for a novella on Sonami. In any case, I’m sure I’ll be back in due time with more graphics and reviews. Quotes and characters belong to the magnificent JY Yang, cover art drawn by the awe-inspiring Yuko Shimizu. NOTE: Post will contain mild SPOILERS for the first Red Rising trilogy! There are no spoilers for Iron Gold, beyond a few quotes you might have seen in other promotional materials. 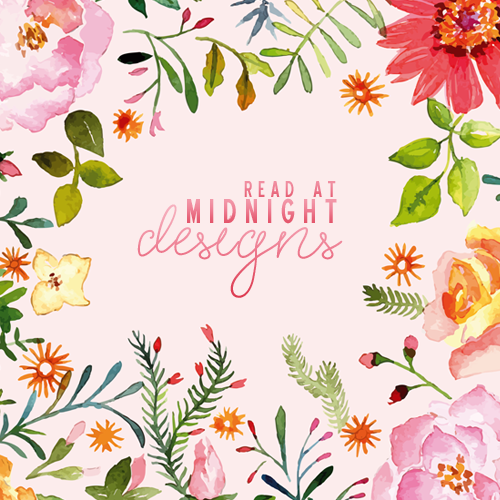 Two graphics posts within a week is unprecedented, but I’ve been very lucky with my 2018 reads and have loved them enough to create edits. Iron Gold is the first of a new trilogy in the Red Rising series, and it’s a game-changer. I usually get series-fatigue with expanded trilogies, but Pierce Brown keeps me coming back for more with his addictive pacing and morally complex characters. I could go on for pages, but I’ll save it for my review, published next week! Quotes belong to Howler alpha Pierce Brown, official character artwork by artist Magali Villeneuve. Darrow of Lykos is a living legend, after all, he is the man who led the Rising against the Republic. Ten years later, Darrow serves as an ArchImperator in the Republic he helped built – but victory did not guarantee him a happy ending. His journey in Iron Gold is an entanglement of internal conflicts and treacherous external pressures. The Reaper has never felt more human and fallible, and it makes for a damn good story. Although Octavia au Lune is long dead, the powerful ghost of the old Society remains – whether it’s from the war against the Ash Lord, or in The Rim where the pyramid of Society stands unchallenged. Lysander’s narrative is one that I found simultaneously infuriating and utterly compelling, I’ll be back for more. Lyria of Lagalos presented us with my favourite quote from Iron Gold. Liberated with the rest of the Reds through the efforts of The Rising, Lyria and her kin found themselves shackled by bonds of a different sort: poverty, prejudice, and marginalisation by society. Her chapters are filled with rage, but they’re some of my favourites in the book. Ephraim ti Horn is disenchanted by society and its promises, made cynical by the tragedies he’s seen unfold. His voice vastly differ from the other characters, and his actions unpredictable – he’s a wild card and I can’t wait for you all to meet him. I. The 3 Quotes, 3 Days meme. I was nominated by The Fiction Fairy + The Bookish Barrister! Thank you both! I didn’t want to do 3 days’ worth of posting so I combined it into one post. II. The Potato Prints feature at the Social Potato. Faye has given me her blessing to do something similar here! The book being featured on today’s iPhone wallpaper is Golden Son by Pierce Brown. It was my favourite read last month and you can check out my review here. I think they will become a regular monthly feature, please leave suggestions if you want to see a certain quote/series or if you want me to offer them in different sizes (e.g. other phones, bookmark size). Without further adieu, here’s the wallpapers. Click on the links below each preview image to download the full size from Dropbox! 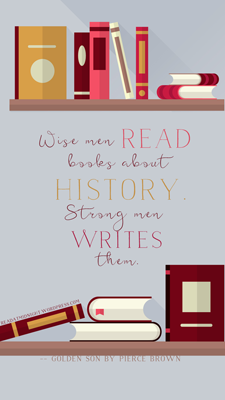 Wise men read books about history. Strong men writes them.